Grab any 2 packets of freshly baked cookies in bag and choose your favourite cookies flavour! Available in 80g, 100g or 200g at a special price! 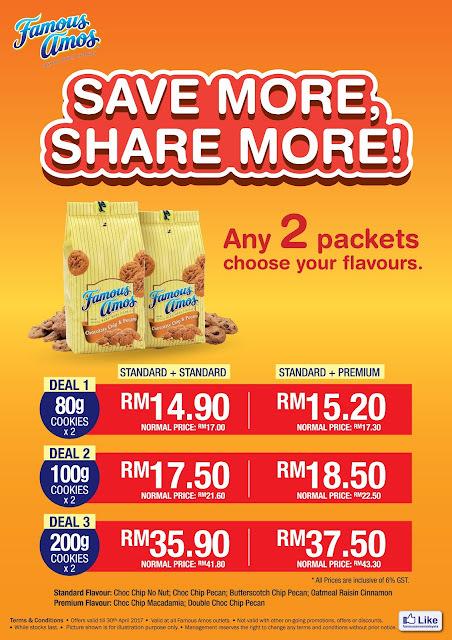 Visit nearest Famous Amos outlet today! To save more, then share more today! Offer valid till 30th April 2017. Valid at all Famous Amos outlets. Not valid with other on-going promotions, offers or discounts. Picture shown is for illustration purpose only. Management reserves the right to change any terms and conditions without prior notice.